Background: Mutations of the transforming growth factor β (TGFβ) receptor components ENDOGLIN and ALK-1 cause the autosomal dominant vascular disorder hereditary haemorrhagic telangiectasia (HHT). Heterozygous mutations of the type II receptor BMPR2 underlie familial primary pulmonary hypertension. Objective: To investigate kindreds presenting with both pulmonary hypertension and HHT. Methods: Probands and families were identified by specialist pulmonary hypertension centres in five countries. DNA sequence analysis of ALK-1, ENDOGLIN, and BMPR2 was undertaken. Cellular localisation was investigated by heterologous overexpression of mutant constructs in both BAEC and HeLa cells. The impact of a novel sequence variant was assessed through comparative analysis and computer modelling. Results: Molecular analysis of 11 probands identified eight missense mutations of ALK-1, one of which was observed in two families. Mutations were located within exons 5 to 10 of the ALK-1 gene. The majority of ALK-1 mutant constructs appeared to be retained within the cell cytoplasm, in the endoplasmic reticulum. A novel GS domain mutation, when overexpressed, reached the cell surface but is predicted to disrupt conformational changes owing to loss of a critical hydrogen bond. Two novel missense mutations were identified in ENDOGLIN. Conclusions: The association of pulmonary arterial hypertension and HHT identifies an important disease complication and appears most common among subjects with defects in ALK-1 receptor signalling. Future studies should focus on detailed molecular analysis of the common cellular pathways disrupted by mutations of ALK-1 and BMPR2 that cause inherited pulmonary vascular disease. BMPR-II, endoglin, and ALK-1 are membrane bound receptor members of the TGFβ signalling superfamily, which controls diverse cellular processes including cell differentiation, proliferation, and apoptosis in embryonic and mature tissues.9 Activation of the TGFβ pathway follows ligand binding and complex formation with type I and type II serine/threonine receptors at the cell surface. This process can be facilitated by accessory receptors, such as endoglin, interacting with the ligand–receptor complex, as occurs in ALK-1 heteromeric complex formation in endothelial cells. Intracellular signalling is propagated by receptor complexes phosphorylating specific groups of receptor regulated Smads (R-Smads), which complex with the comediator Smad 4 and are translocated to the nucleus to target transcriptional regulation of a restricted range of genes, in a cell type and context specific nature (reviewed by Shi and Massague9). In this paper we describe a cohort of 14 independently ascertained probands, 13 of whom presented with clinical features of pulmonary hypertension together with either a personal or family history of HHT. We have undertaken molecular analysis of the ALK-1, ENG, and BMPR2 genes, and investigated the functional impact of mutations identified. The findings show the importance of ALK-1 mediated signalling in the maintenance of the pulmonary vasculature, identify a novel molecular defect of type I TGFβ signalling in disease, and establish pulmonary hypertension as an important complication of HHT. Patients with a personal or family history of HHT and pulmonary hypertension were recruited from centres specialising in the treatment of this condition in England, Germany, Australia, and the USA. Patients were classified as having a probable or definite diagnosis of HHT according to the Curaçao criteria.11 In addition, a population based cohort of 21 Finnish subjects diagnosed with primary pulmonary hypertension was screened for mutations in ALK-1, BMPR2, and ENG. Pulmonary hypertension was defined by standard clinical methods, including cardiac catheterisation (n = 13), as described previously.10 One subject was investigated by echocardiography alone (see table 1 for details). All studies were done after informed consent had been obtained and with the approval of the Trent multi-research ethics committee or the relevant institutional review board. The protein coding sequence of ALK-1 (exons 2–10, primers as previously described13), ENG (exons 1–13, primers available on request), and BMPR2 (exons 1–13, primers available on request) together with intron–exon boundaries were amplified from genomic DNA by polymerase chain reaction (PCR). PCR products were purified using the QIAquick purification kit (Qiagen) and sequenced with the Applied Biosystems Big Dye terminator kit and the ABI PRISM 377. Sequence variants that altered restriction enzyme sites were confirmed by restriction digest of PCR amplified products according to the manufacturer’s instructions, with fragments visualised on 2% agarose gels containing ethidium bromide. Control chromosomes (n = 150) were examined for the presence of the identified sequence variants. In view of its distinct genetic heritage, a further 120 chromosomes, from unrelated unaffected subjects from Finland, were also examined specifically for the presence of the D179A mutation. Homology modelling techniques were used to generate the three dimensional structure of the ALK-1 kinase and GS domain, based on the crystal structure of the homologous type I TGFβ receptor ALK-5, as described previously.14 The SwissPDB program was used to examine the impact of D179A missense mutation in the GS domain of ALK-1 on the model. The respective amino acid side chains of D179 were altered to correspond to those of A179, and potential alterations in the hydrogen bonding scheme or the presence of induced steric clashes were considered. The pT7T3DPac I.M.A.G.E clone (ID 2345585)—which contained all of the ALK-1 coding sequence (1509 bp), 82 base pairs (bp) of the 5′ untranslated region (UTR), and 145 bp of the 3′ UTR—was inserted into pcDNA3 expression vector using Hind III and EcoR I. To generate the 3′ GFP-ALK-1 wild type construct, the stop codon and 3′ UTR were removed by PCR using forward primer 5′ CTA GCT GTG TCC GCG GCA TGC GGC CTG 3′ (Sac II restriction site underlined) with reverse primer 5′ CAG AAT TCC GGA TCC GCT TGA ATC ACT TTA GG 3′ (EcoR I and BamH I restriction sites bold and underlined, respectively). The pcDNA3-ALK-1 and PCR products were both digested with Sac II and EcoR I and ligated. The entire coding region of ALK-1 (with its 5′ UTR) was then removed by digestion from pcDNA3 with Hind III and BamH I, and the 1591 bp fragment was inserted into Hind III/BamH I digested pEGFPNI vector (Clontech). The presence of a signal peptide in ALK-1 prevented the direct GFP tagging of the 5′ end of the protein. Using PCR and a three step cloning strategy (full details available on request) a myc-tag was inserted between the signal peptide and the mature protein. Mutant constructs were generated by subjecting both wild type constructs to site directed mutagenesis using the Stratagene QuikChange protocol. The sequences of the wild type and mutant constructs were confirmed by DNA sequencing of the entire receptor with GFP or myc tag as appropriate. Bovine aortic endothelial cells (BAEC) or HeLa cells were seeded on glass coverslips in six-well plates at 2×105 or 4×105 cells per well, respectively, and grown for 24 hours in DMEM/10% fetal calf serum. One microgram of wild type or mutant construct was used to transiently transfect cells using 3 μl of the FuGene (Roche) transfection reagent system. Transfectants were grown for another 48 hours, then fixed in 4% paraformaldehyde in phosphate buffered saline (PBS). 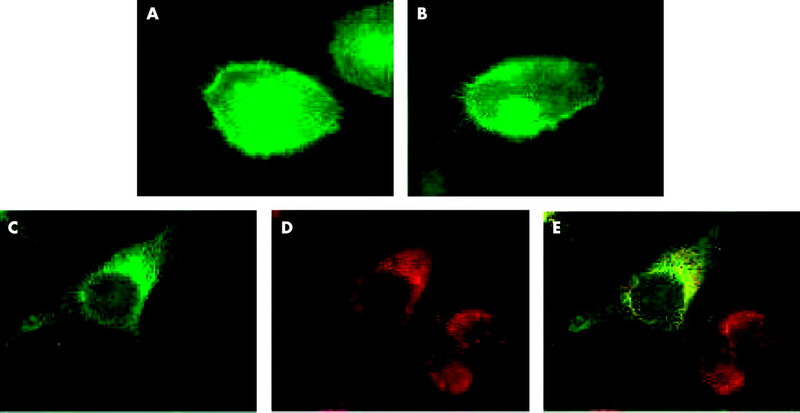 Cells were permeabilised with 0.4% (vol/vol) Triton-X for four minutes before immunostaining of myc-tagged constructs or endoplasmic reticulum. Myc tagged transfectants were incubated with the anti-myc monoclonal primary antibody (9E10) at a dilution of 1 in 250 in a 3% solution of bovine serum albumin (BSA) for one hour. To visualise the endoplasmic reticulum, cells were incubated with the KDEL monoclonal primary antibody (Stressgen Biotechnologies) at a dilution of 1 in 250 (vol/vol) in 3% BSA for one hour. Subsequent incubations for both primary antibodies were with biotinylated anti-mouse IgG antibody (Amersham) for one hour at a 1 in 100 dilution in 3% BSA, followed by Streptavidin Texas Red (Amersham) at a 1 in 200 dilution in 3% BSA for 45 minutes. Coverslips were mounted on microscope slides in glycerol/PBS solution. Cells were viewed and photographed using a fluorescent microscope (Zeiss) and images captured using SmartCapture 2 software. Transfection efficiency for GFP and myc-tagged constructs was approximately 30% in HeLa cells, and 5% in BAEC. Clinical details and investigative findings in the 14 probands are summarised in table 1. Twelve subjects were recruited by centres in England, Germany, Australia, and the USA. Two further probands (7685 and 7682) were identified in a cohort of Finnish patients with primary pulmonary hypertension, with full details of this series described elsewhere (manuscript submitted). Twelve patients presented with haemodynamic evidence of pulmonary arterial hypertension unexplained by a hyperdynamic circulation, a syndrome we now describe as HHT related pulmonary arterial hypertension. For two of these subjects, additional recognised risk factors for pulmonary arterial hypertension were identified. Subject 8261 had an atrial septal defect repaired before the onset of significantly raised pulmonary artery pressures, and also had a sibling diagnosed with primary pulmonary hypertension who had plexogenic pulmonary vascular changes at necropsy. Patient 7340 gave a history of six months’ exposure to an appetite suppressant, at least eight years before the onset of symptoms. In contrast, two further subjects with HHT and raised pulmonary artery pressures had clear evidence of other causes of pulmonary hypertension. In patient 8151, haemodynamic studies reveal a raised mean pulmonary artery pressure associated with a minimally raised pulmonary vascular resistance, findings consistent with a hyperdynamic circulation probably caused by extensive systemic arteriovenous malformations. Finally, subject 7684 developed pulmonary hypertension following massive thromboembolic disease. No material was available for DNA analysis in three families presenting with clinical or histological features of HHT related pulmonary arterial hypertension. A heterozygous mutation of ALK-1 was identified in nine probands, each with HHT related pulmonary arterial hypertension, of which the C344Y mutation was detected in two independently ascertained probands (from Germany and the USA) and has also been reported previously.12 Four of the eight ALK-1 mutations are novel and each represents a missense change (table 1). With one exception, each substitution is located within the kinase domain and alters an amino acid that is highly conserved across type I members of the TGFβ receptor family and between species for which sequence is available (fig 1). The D179A substitution is located within the GS region, a helix-loop-helix structure proximal to the kinase domain. Heterozygous mutations of ENG were identified in two subjects (7684 and 8151), each representing a novel frameshift mutation and predicted to lead to premature truncation of the transcript. None of the mutations was identified among appropriate matched control groups. ALK-1 cDNA with mutations identified in patients with HHT related pulmonary arterial hypertension; mutations previously reported10 indicated by an asterisk. The ALK-1 catalytic kinase domain is predicted to contain a small N-lobe and a larger, mostly helical C-lobe. The aspartic acid residue at position 179 is located in the αGS1 helix of the GS domain of the small N-lobe (fig 2A). Substitution of aspartic acid 179 by alanine replaces an acidic residue with a neutral, weakly hydrophobic residue. One of the two hydrogen bonds to Arg252 is destroyed (fig 2B). Potential disruption of the GS domain of ALK-1 resulting from the substitution of aspartic acid residue 179 with alanine. (A) Aspartic acid (Asp179 shown in red) forms two strong hydrogen bonds (H-bonds) to arginine 252 (Arg 252). (B) Substitution of Asp179 with an uncharged alanine residue (Ala179 shown in red) destroys one of these two H-bonds (calculated using SwissPDB program). Carbon atoms are represented by black bars, oxygen by white bars, hydrogen by turquoise, sulphur by yellow, nitrogen by blue, and strong H bonds are shown in green. αGS1/2 denotes the αGS helices of the GS domain, and αC the αC helix of the N lobe of the kinase domain. (C) Conservation of amino acid residue Asp179. To investigate the impact of mutation of ALK-1 on protein localisation, we carried out transient transfection of either GFP (n = 11) or myc (n = 9) tagged mutant constructs. A range of mutant constructs was designed to include mutations of different classes from all known functional domains of ALK-1, and hence includes mutations identified in this and previous studies (table 2). Mutant constructs with myc tags located in a 5′ position were used to investigate truncating mutations and to confirm that the presence of the large 3′ GFP tag did not impede protein trafficking. Both GFP and myc-tagged wild type ALK-1 constructs reached the cell surface (fig 3A). Only three ALK-1 mutations generated proteins capable of targeting the cell surface appropriately when overexpressed (fig 3B). Two of these, D179A and K487T, were characterised in subjects with pulmonary hypertension. The 12 further ALK-1 mutations appeared to be retained in the cell cytoplasm and colocalised with KDEL staining of the endoplasmic reticulum (fig 3C, 3D, and 3E). Immuofluorescence microscopy of HeLa and BAEC cells transiently transfected with GFP tagged wild type mutant constructs. (A) Wild type GFP tagged ALK-1 construct showing cell surface localisation. (B) Representative of GFP tagged mutant constructs D179A, del S232, K487T showing cell surface localisation comparable to wild type. (C) Representative of GFP tagged ALK-1 mutant constructs G48E;A49P, W50C, R67Q, C77W, G211D, delD254, S333I, C344Y, R374Q, P378L, R411Q, Q490X showing intracellular localisation. (D) Endoplasmic reticulum immunostained with anti-KDEL antibody (red). (E) Superimposition of KDEL (red) and GFP signals clearly shows endoplasmic reticulum localisation of mislocalised mutants (yellow). Hereditary haemorrhagic telangiectasia and familial primary pulmonary hypertension represent inherited disorders of the vascular system caused by mutation of components of the TGFβ receptor mediated signalling system. We have identified a cohort of 14 subjects with pulmonary hypertension of whom 13 had a documented personal and/or family history of HHT. Among 11 probands in whom molecular analysis was possible, eight distinct mutations of the TGFβ type I receptor ALK-1 were identified in nine subjects. The two remaining subjects were found to harbour novel heterozygous mutations in the gene encoding the TGFβ accessory protein endoglin. Clinical findings in these patients illustrate the complex aetiology of pulmonary hypertension in individuals with HHT. Pulmonary hypertension has typically been described in HHT as a consequence of high blood flow through large arteriovenous malformations leading to an increased cardiac output, often with evidence of left ventricular failure.20 These findings are illustrated by patient 8151 in the present series, who was found to have a novel ENG mutation and in whom hepatic blood flow through extensive liver arteriovenous malformations was estimated to exceed four litres a minute. However, most subjects in this cohort have HHT related pulmonary arterial hypertension as we have previously described.10 In this syndrome pulmonary hypertension is characterised by a significantly raised pulmonary artery pressure, with high pulmonary vascular resistance, normal pulmonary artery wedge pressure, and a normal or low cardiac output. Importantly, all patients fulfilling these criteria were found to have ALK-1 mutations. Of the eight ALK-1 mutations identified in this study, four appear to be novel, bringing the total number of disease causing defects reported in the ALK-1 gene to 54.21 Taken together with our initial report of HHT related pulmonary arterial hypertension,10 13 ALK-1 mutations (24%) have been characterised in probands with HHT related arterial pulmonary hypertension, emphasising the importance of this complication in HHT2. All the mutations identified are missense changes and were not detected among controls. Seven of the eight ALK-1 mutations reported alter highly conserved amino acids within the functional kinase domain of the type I receptor.13 Of these, two mutations (R374W and R374Q) substitute arginine at codon 374 with tryptophan or glutamine, respectively. The mutation R411Q, also in exon 8, and the mutation R411W identified in the previous series,10 both replace arginine with glutamine or tryptophan. In all, five mutations in exon 8 have been identified among subjects with HHT related pulmonary arterial hypertension, more than any other region of the ALK-1 gene. Identification of recurrent sites of mutation within exon 8 identifies critical regions for kinase activity mediating the ALK-1 receptor cellular response in vascular development and repair. Of interest, the ALK-1 mutation C344Y, which has previously been reported to cause HHT, was detected in two probands independently ascertained through centres in Germany and the USA. Genealogical information failed to identify a common ancestor, and relatives were not available for conclusive haplotype analysis. The exon 10 mutation, K487T, represents the most distal missense substitution thus far identified and falls within the highly conserved COOH domain of ALK-1. The region, from codons 479 to 489 contains a so called NANDOR BOX which appears to be necessary for regulation of TGFβ signalling.22 Taken together with the previous report of the R484W mutation,10 these findings imply important structural requirements for this domain and suggest that perturbation of these may critically affect the NANDOR BOX activity, particularly with regard to the pulmonary vasculature. The D179A mutation (exon 5) identified in a patient with primary pulmonary hypertension without known features of HHT is of particular interest. The patient died recently in Finland, aged 54 years, and retrospective analysis confirmed the diagnosis of primary pulmonary hypertension, but no mention was made in the case history or at necropsy of either the symptoms (for example, epistaxis) or the pathological features (arteriovenous malformations) of HHT. The mutation was not detected among a further group of control subjects (n = 60) recruited from the same region of Finland. Parents or surviving relatives were not available for study. 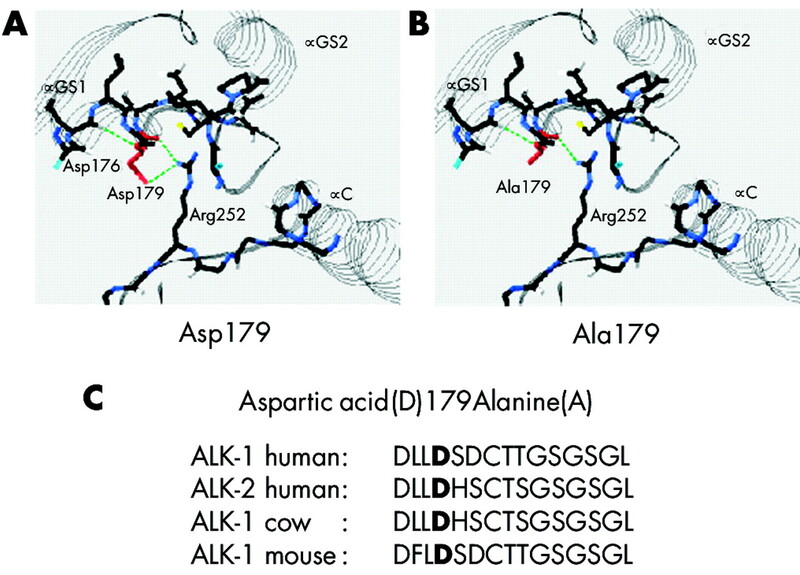 The ALK-1 mutation leads to an amino acid substitution of aspartic acid by alanine at codon 179 which is conserved across species and type I receptors and lies within the so called GS domain, a serine and threonine residue rich region (fig 2C). The GS domain is critical for regulation of receptor activity—for example, the immunophilin FKBP12 inhibits TGFβ signalling by competitive binding to unphosphorylated GS residues of the type I receptor, which also maintains the kinase domain in an inactive state.23 In contrast, phosphorylation has been shown, at least for TβR1, to “switch” the GS domain into a binding surface for R-Smads and significantly increase the efficiency of receptor mediated phosphorylation of C-terminal serine Smad residues.24 Overexpression studies of a GFP fusion protein for the D179A mutation demonstrated localisation to the cell surface, implying that the mutation does not lead to significant protein misfolding. Structural modelling, however, showed that the substitution of aspartic acid (a polar acidic amino acid) for alanine (a non-polar weakly hydrophobic amino acid) results in the loss of a hydrogen bond formed with an arginine at position 252, a residue critical for GS–kinase domain interaction (fig 2A and 2B). No disease related mutations of the GS region had hitherto been reported.21 Thus the present findings suggest a novel form of molecular defect in TGFβ signalling associated with the development of pulmonary hypertension. To investigate further the potential functional differences between known pathogenic ALK-1 mutations, we undertook heterologous overexpression studies of both ligand binding and cytoplasmic domain mutations. We observed that the majority of all mutations failed to reach the cell surface, presumably as a result of significant protein misfolding.25 These findings were consistent when studied using myc or GFP tagged mutant constructs. Thus initial functional analysis provides no evidence to distinguish those ALK-1 mutations associated with pulmonary hypertension. Taken together with a previous report of protein expression in vivo in HUVEC samples from HHT2 families,12 these data support haploinsufficiency as the inherited mechanism for this disorder. Further functional analysis of downstream ALK-1 signalling is substantially hampered by difficulties in producing an adequate in vitro representation of its signalling complex; hence we cannot rule out dominant negative effects of some mutations, and in particular those shown to reach the cell surface (D179A, delS232, and K487T). Although marked clinical variability exists both within and between families, current data show that clinical manifestations of ALK-1 mediated HHT are observed with high penetrance by the age of 40 years.18,26,27ALK-1 defects less commonly lead to HHT related pulmonary arterial hypertension. In familial primary pulmonary hypertension, we know that pathogenic mutations in BMPR2 are required but are not sufficient for the development of disease, with many instances of non-penetrance described.28,29 Taken together, these data indicate a need for exposure to as yet unknown “trigger” factors, in addition to a genetic susceptibility. In this regard it is of interest that patient 7340 gave a history of exposure to appetite suppressants, a known risk factor for the development of pulmonary hypertension. It is unclear whether exposure to appetite suppressants was causal of disease in this patient. The molecular basis for an interaction between appetite suppressant exposure and a genetic susceptibility generated by defects in BMPR2 or ALK-1 requires further study.8 A recent report of a patient harbouring a pathogenic ENG mutation developing pulmonary hypertension following documented fenfluramine exposure (Soubrier F, personal communication) neither resolves nor detracts from the hypothesis that such an interaction may occur. It is of interest that among this present series, selected on the basis of patient referral with HHT and pulmonary hypertension, we only detected ENG mutations in patients with causes for raised pulmonary artery pressures that were distinct from pulmonary hypertension. Hence the role of the accessory protein endoglin in predisposing to pulmonary hypertension must await further assessment, including a search for subjects with ENG mutations and the syndrome of HHT related pulmonary arterial hypertension, in the absence of other recognised and potentially independent risk factors. It is clear that pulmonary hypertension is an important and not infrequent complication of ALK-1 mediated disease. HHT should also be considered, and may require screening for, in patients presenting with apparent primary pulmonary hypertension. For example, a girl (7682) with no personal history of HHT but whose mother was affected developed severe pulmonary hypertension at age 17 years and died within 12 months. Finally, and to further emphasise the complex management issues in this group of disorders, patient 7684 was identified as having endoglin mediated HHT and developed pulmonary hypertension secondary to massive thromboembolic disease, showing that other causes of pulmonary hypertension may also coexist in HHT patients. The identification of human mutations in receptor components of the TGFβ receptor and vascular disease has provided important targets for further investigation and understanding of vasculogenesis and blood vessel response to injury. Analysis of specific patient cohorts offers additional insight into the functional requirements and specificity of these pathways but also has important implications for the long term management of families with such inherited disorders. A recent study30 has reported a disease causing mutation in the GS domain of BMPR1B—another type 1 receptor in the TGFβ pathway. We wish to thank all of the patients and their relatives who have kindly participated in this study. We additionally thank Claire Dixon and Rachel Marriott for technical and secretarial assistance, respectively. This work is supported by a BHF programme grant RG/2000012 (RCT and NWM) and in Finland by The Academy of Finland and The Finnish National Technology Agency Tekes. REH is the recipient of a BHF clinical fellowship. McAllister KA, Grogg KM, Johnson DW, Gallione CJ, Baldwin MA, Jackson CE, Helmbold EA, Markel DS, McKinnon WC, Murrell J. Endoglin, a TGF-beta binding protein of endothelial cells, is the gene for hereditary haemorrhagic telangiectasia type 1. Nat Genet1994;8:345–51. Johnson DW, Berg JN, Baldwin MA, Gallione CJ, Marondel I, Yoon SJ, Stenzel TT, Speer M, Pericak-Vance MA, Diamond A, Guttmacher AE, Jackson CE, Attisano L, Kucherlapati R, Porteus ME, Marchuk DA. Mutations in the activin receptor-like kinase 1 gene in hereditary haemorrhagic telangiectasia type 2. Nat Genet1996;13:189–95. Attisano L, Carcamo J, Ventura F, Weis FM, Massague J, Wrana JL. Identification of human activin and TGF beta type I receptors that form heteromeric kinase complexes with type II receptors. Cell1993;75:671–80. Pece-Barbara N, Wrana JL, Letarte M. Endoglin is an accessory protein that interacts with the signaling receptor complex of multiple members of the transforming growth factor-beta superfamily. J Biol Chem1999;274:584–94. International PPH Consortium:, Lane KB, Machado RD, Pauciulo MW, Thomson JR, Phillips JA, Loyd JE, Nichols WC, Trembath RC. Heterozygous germline mutations in BMPR2, encoding a TGF-beta receptor, cause familial primary pulmonary hypertension. The International PPH Consortium. Nat Genet2000;26:81–4. Deng Z, Morse JH, Slager SL, Cuervo N, Moore KJ, Venetos G, Kalachikiv S, Cayanis E, Fischer SG, Barst RJ, Hodge SE, Knowles JA. Familial primary pulmonary hypertension (gene PPH1) is caused by mutations in the bone morphogenetic protein receptor-II gene. Am J Hum Genet2000;67:737–44. Thomson JR, Machado RD, Pauciulo MW, Morgan NV, Humbert M, Elliott GC, Ward K, Yacoub M, Mikhail G, Rogers P, Newman J, Wheeler L, Higenbottam T, Gibbs JS, Egan J, Crozier A, Peacock A, Allcock R, Corris P, Loyd JE, Trembath RC, Nichols WC. Sporadic primary pulmonary hypertension is associated with germline mutations of the gene encoding BMPR-II, a receptor member of the TGF-beta family. J Med Genet2000;37:741–5. Humbert M, Deng Z, Simonneau G, Barst RJ, Sitbon O, Wolf M, Cuervo N, Moore KJ, Hodge SE, Knowles JA, Morse JH.BMPR2 germline mutations in pulmonary hypertension associated with fenfluramine derivatives. Eur Resp J2002;20:518–23. Shi Y, Massague J. Mechanisms of TGF-beta signaling from cell membrane to the nucleus. Cell2003;113:685–700. Trembath RC, Thomson JR, Machado RD, Morgan NV, Atkinson C, Winship I, Simonneau G, Galie N, Loyd JE, Humbert M, Nichols WC, Morrell NW, Berg J, Manes A, McGaughran J, Pauciolo M, Wheeler L. Clinical and molecular genetic features of pulmonary hypertension in patients with hereditary hemorrhagic telangiectasia. N Engl J Med2001;345:325–34. Shovlin CL, Guttmacher AE, Buscarini E, Faughnan ME, Hyland RH, Westermann CJ, Kjeldsen AD, Plauch H. Diagnostic criteria for hereditary hemorrhagic telangiectasia (Rendu-Osler-Weber syndrome). Am J Med Genet2000;91:66–7. Abdalla SA, Pece-Barbara N, Vera S, Tapia E, Paez E, Bernabeu C, Letarte M. Analysis of ALK-1 and endoglin in newborns from families with hereditary hemorrhagic telangiectasia type 2. Hum Mol Genet2000;9:1227–37. Berg JN, Gallione CJ, Stenzel TT, Johnson DW, Allen WP, Schwartz CE, Jackson CE, Porteus ME, Marchuk DA. The activin receptor-like kinase 1 gene: genomic structure and mutations in hereditary hemorrhagic telangiectasia type 2. Am J Hum Genet1997;61:60–7. Abdalla SA, Cymerman U, Johnson RM, Deber CM, Letarte M. Disease-associated mutations in conserved residues of ALK-1 kinase domain. Eur J Hum Genet2003;11:279–87. Kjeldsen AD, Brusgaard K, Poulson L, Kruse T, Rasmussen K, Green A, Vase P. Mutations in the ALK-1 gene and the phenotype of hereditary hemorrhagic telangiectasia in two large Danish families. Am J Med Genet2001;98:298–302. Lin WD, Wu JY, Hsu HB, Tsai FJ, Lee CC, Tsai CH. Mutation analysis of a family with hereditary hemorrhagic telangiectasia associated with hepatic arteriovenous malformation. J Formos Med Assoc2001;100:817–19. Klaus DJ, Gallione CJ, Anthony K, Yeh EY, Yu J, Lux A, Johnson DW, Marchuk DA. Novel missense and frameshift mutations in the activin receptor-like kinase-1 gene in hereditary hemorrhagic telangiectasia. Mutations in brief no. 164. Online. Hum Mutat1998;12:137. McDonald JE, Miller FJ, Hallam SE, Nelson L, Marchuk DA, Ward KJ. Clinical manifestations in a large hereditary hemorrhagic telangiectasia (HHT) type 2 kindred. Am J Med Genet2000;93:320–7. Olivieri C, Mira E, Delu G, Pagella F, Zambelli A, Malvezzi L, Buscarini E, Danesino C. Identification of 13 new mutations in the ACVRL1 gene in a group of 52 unselected Italian patients affected by hereditary haemorrhagic telangiectasia. J Med Genet2002;39:E39. Sapru RP, Hutchinson DC, Hall JI. Pulmonary hypertension in patients with pulmonary arteriovenous fistulae. Br Heart J1969;31:559–69. van den Driesche S, Mummery CL, Westermann CJ. Hereditary hemorrhagic telangiectasia: an update on transforming growth factor beta signaling in vasculogenesis and angiogenesis. Cardiovasc Res2003;58:20–31. Garamszegi N, Dore JJ, Penheiter SG, Edens M, Yao D, Leof EB. Transforming growth factor beta receptor signaling and endocytosis are linked through a COOH terminal activation motif in the type I receptor. Mol Biol Cell2001;12:2881–93. Huse M, Chen YG, Massague J, Kuriyan J. Crystal structure of the cytoplasmic domain of the type I TGF beta receptor in complex with FKBP12. Cell1999;96:425–36. Huse M, Muir TW, Xu L, Chen YG, Kuriyan J, Massague J. The TGF beta receptor activation process: an inhibitor- to substrate-binding switch. Mol Cell2001;8:671–82. Rudarankanchana N, Flanagan JA, Chen H, Utpon PD, Machado RD, Patel D, Trembath RC, Morrell NW. Functional analysis of bone morphogenetic protein type II receptor mutations underlying primary pulmonary hypertension. Hum Mol Genet2002;11:1–9. Porteous ME, Burn J, Proctor SJ. Hereditary haemorrhagic telangiectasia: a clinical analysis. J Med Genet1992;29:527–30. Abdalla SA, Geisthoff UW, Bonneau D, Plauchu H, McDonald J, Kennedy S, Faughnan ME, Letarte M. Visceral manifestations in hereditary haemorrhagic telangiectasia type 2. J Med Genet2003;40:494–502. Loyd JE, Primm RK, Newman JH. Familial primary pulmonary hypertension: clinical patterns. Am Rev Respir Dis1984;129:194–7. Thomas AQ, Gaddipati R, Newman JH, Loyd JE. Genetics of primary pulmonary hypertension. Clin Chest Med2001;22:477–91. Lehmann K, Seemann P, Stricker S, Sammar M, Meyer B, Süring K, Majewski F, Tinschert S, Grzeschik K, Müller A, Knaus P, Nürnberg P, Mundlos S. Mutations in bone morphogenic protein receptor 1B cause brachydactyly type A2. Proc Natl Acad Sci USA2003;100:12277–82.